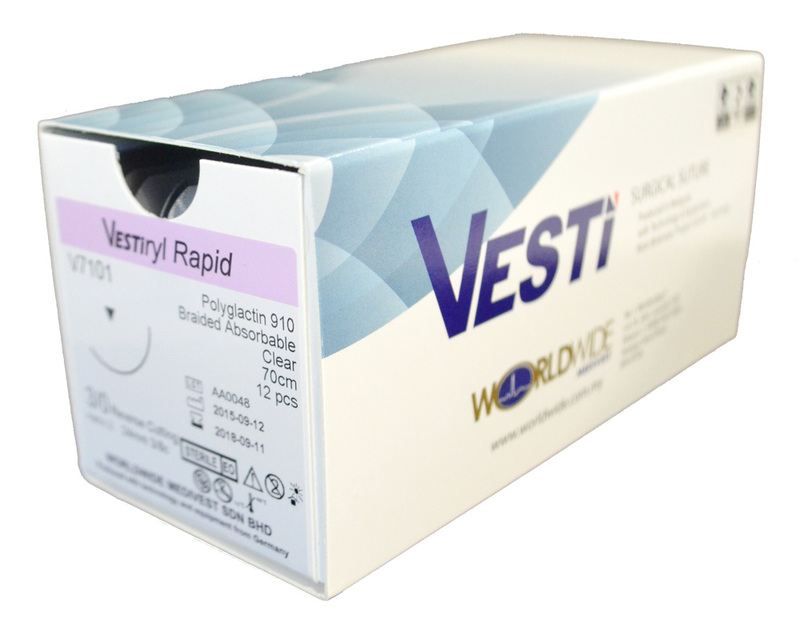 VESTiryl Rapid, braided and coated synthetic absorbable sutures are composed of polyglactine 910, composed of copolymers made from 90% glycolide and 10% L-lactide. Progressive loss of tensile strength and eventual absorption of VESTiryl Rapid suture occurs by means of hydrolysis. Absorption begins as a loss of tensile strength followed by a loss of mass. Vestiryl Plus, braided and coated synthetic absorbable sutures, are composed of LACTOMER 9-lglycolide/lactide copolymer, a synthetic polyester composed of glycolide and lactide, derivatives of glycolic and lactic acids. Degradation process is through hydrolysis, thereby provides predictable and reliable absoprtion. Available in USP sizes I (4 metric) through 4-0 (1.5 metric), un-dyed (natural) or violet coloured. The sutures are supplied sterile, affixed to various needle types, in one doze boxes. 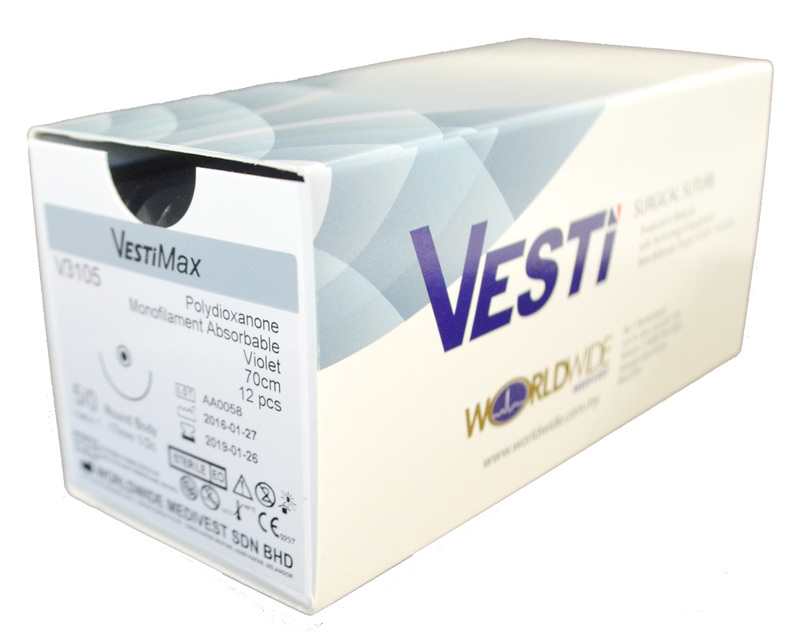 VESTimax, a monofilament, synthetic absorbable suture, prepared from the polyester, poly, (p-dioxanone). THe inherent flexibility of it’s polymer allows a polydioxanone suture to be fabricated into a monifilament fibre useful for all sizes of sutures. It elicits a low order of tissue response and is absorbed by simple hydrolysis. Has greater pliability than polypropylene suture and has greater strength than that of other monofilaments. Available in USP 0 (3.5 metric) through 6/0 (metric 0.7), dyed (violet). The sutures are supplied sterile, affixed to various needle types and sizes, in one dozen (12 pieces) boxes. 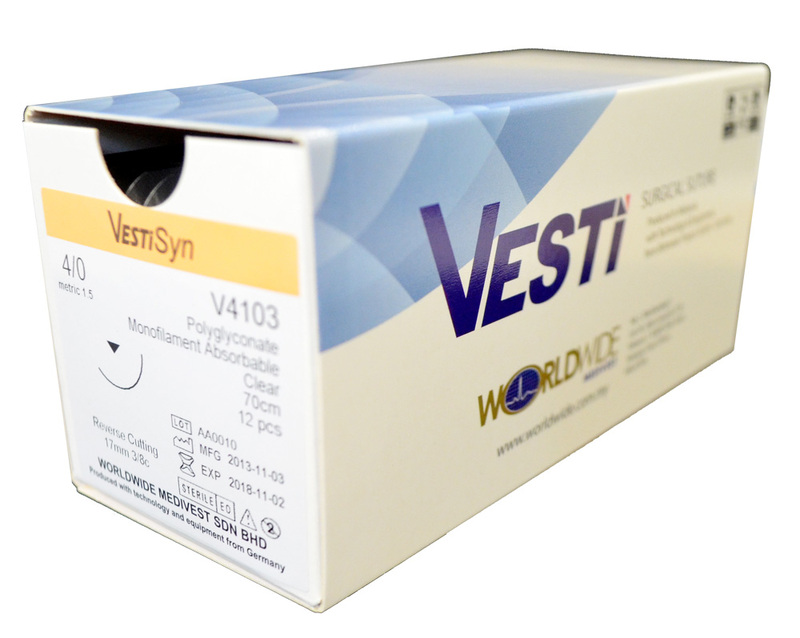 VestiSyn, synthetic absorbable sutures, are synthesized from polyglyconate, a copolymer of glycolic add and trimethylene carbonate. Degradation process is through hydrolysis, thereby provides predictable and reliable absorption. Available in USP sizes 3/0 ﴾2 metric﴿ through 5/0 ﴾1 metric﴿, undyed. The sutures are supplied sterile, affixed to various needle sizes, in one dozen ﴾12 pieces﴿ boxes.